A gorgeous set of 8 French T & V Limoges lunch or dinner plates in an Adirondack design, circa early-20th Century, France. 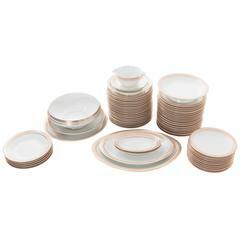 There are 8 plates in set, with three varying design scenes. 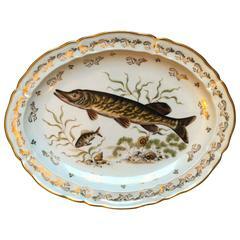 Scenes include fishing boat, beach, bass fish, and plant design, on white porcelain. Beautiful details as show in images. Each plate measures: 9.5" diameter In images #19 and 20, the Adirondack style French Limoges plates with fish and boat design are shown together with the Royal Crown Derby for Tiffany & Co. dinner plates. For more information on the green and gold Royal Crown Derby/Tiffany & Co. plates, search 1stdibs ID#: LU1314213872521. Royal Crown Derby Porcelain, Tiffany & Co.